Here are highlights of upcoming events sponsored by the City of Pasadena. All events are free. 6:30 p.m. – “Streets, Traffic and Transit” is the topic of a panel discussion followed by plenty of audience Q&A at PCC’s Community Education Center, 3035 E. Foothill Blvd. as part of our General Plan update. Speakers are Ellen Greenberg, an expert in smart mobility, sustainable streets and transit-oriented development; and Philip Erickson, president of Community Design + Architecture and a planner, urban designer and architect with special expertise in city streets. (626) 744-4009. 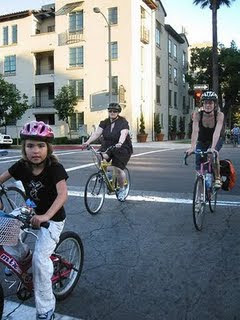 * 6:30 p.m. – How can Pasadena’s bikeway system be improved? Bring your best ideas to a meeting at Jackie Robinson Center, 1020 N. Fair Oaks Ave. (626) 744-7254. * 7 p.m. – All seven Pasadena City Council members will host discussions in their respective districts about future priorities for Pasadena as part of our General Plan update. The first will be hosted by City Councilman Terry Tornek for District 7 residents at Hamilton Elementary School, 2089 Rose Villa St. (626) 744-4009. 11 a.m. – The Latino Heritage Parade will begin on Los Robles Avenue at Howard Street, head south to Washington Boulevard, then west to a jamaica/community fair at La Pintoresca Park with free arts and crafts, entertainment, exhibits and food until 4 p.m. Wave to City of Pasadena officials in the parade and stop by the City of Pasadena booths at the jamaica! (626) 791-7421. 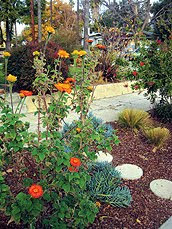 5 p.m. – Join Pasadena City Councilman Terry Tornek for a walk through District 7. Meet at the Assistance League’s Craft Fair Gift Shop, 820 E. California Blvd. Parking is available in the lot at the shop and on Hudson Avenue. 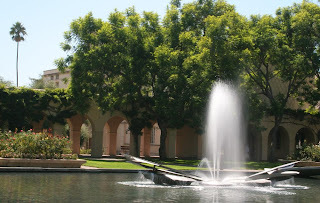 The walk, which will begin promptly at 5:15 p.m., will highlight scenic Arden Road and the Caltech campus, followed by a raffle and refreshments. For more information visit www.upandmoving.org or call District 7 Field Representative Pamela Thyret at (626) 744-4737. * 3 p.m. – From parks to community centers, the City of Pasadena has plans for making structural improvements to public places so people with disabilities can use them safely and conveniently. Learn more at a community meeting hosted by the Accessibility and Disability Commission in the Grand Conference Room (basement room 038) at Pasadena City Hall, 100 N. Garfield Ave. (626) 744-4762. 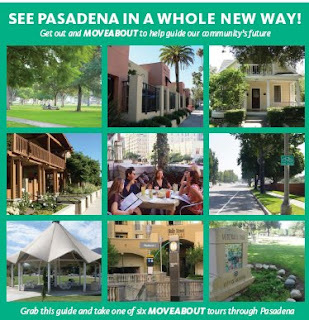 * 6:30 p.m. – Pasadena City Councilman Steve Haderlein will host a District 4 workshop about future priorities for Pasadena at the historic Stuart Pharmaceutical Building, 3660 E. Foothill Blvd., as part of our General Plan update. (626) 744-4009. * 7:30 a.m. – Join Pasadena Mayor Bill Bogaard, Fire Chief Dennis Downs and Pasadena Forward’s Executive Director Israel Estrada for a walk around the 3.3-mile Rose Bowl Loop. Meet at Gate A at the Rose Bowl Stadium. (626) 831-2980. * 6:30 p.m. – Pasadena City Councilwoman Jacque Robinson will host a District 1 workshop about future priorities for Pasadena at the Rose Bowl Press Box, 1001 Rose Bowl Dr., as part of our General Plan update. (626) 744-4009. * 6 to 10 p.m. – More than a dozen of our community’s finest institutions will open their doors for free during ArtNight Pasadena. Complimentary curb-to-curb shuttles will whisk you from one venue to the next. Be sure to stop by Pasadena Central Library, where the Crown City Chamber Players will perform classical hits. www.artnightpasadena.org. (626) 744-7887. * 8 to 11:30 a.m. – Are you ready to go solar at your home? Price reductions, a 30 percent federal tax credit and hefty rebates from Pasadena Water and Power make it easier than ever! Learn more at a workshop at the Salvation Army, 960 E. Walnut St., including a comprehensive overview of incentives, how to choose an installer, and more. Reservations are required. (626) 744-6970. Register for after-school homework help, tutoring and recreation on school days through May 28 for kids in first through eighth grades at Robinson Park Center, 1085 N. Fair Oaks Ave. (626) 744-7501. Have you taken one or more MoveAbout Tours yet as we prepare for the General Plan update? 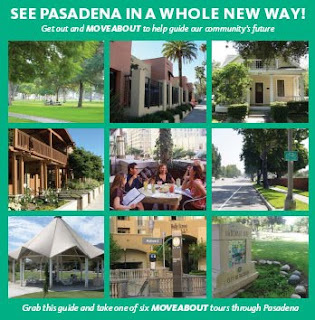 Download a guidebook or pick one up at Pasadena Central Library, Pasadena City Hall and other locations. Be sure to include your feedback and return your booklets no later than Monday, Oct. 12. The General Plan is the blueprint for our community's future, so let your voice be heard! (626) 744-4009. Many thanks to Latina Heritage for use of the parade photo. One of my favorite local history books is the 565-page "Pasadena, California, Historical and Personal: A Complete History of the Organization of the Indiana Colony" by early Pasadena historian and newspaperman J.W. Wood, published in 1917. The subtitle is "Its Establishment on the Rancho San Pascual and Its Evolution into the City of Pasadena, Including a Brief Story of San Gabriel Mission, the Story of the Boom and Its Aftermath, and the Political Changes and Personages Involved in this Transformation. Churches, Societies, Homes, etc. Brought Down to Date and Fully Illustrated." I encourage you to visit the book (there are several copies) in the Centennial Room at Pasadena Central Library. You can't check it out and take it home, but why would you want to when that wonderful room beckons you to sit down and stay awhile? I love every single page of this detailed, fascinating book, but I want to share with you the final passage titled "A Prognosis." But of the future? It may require no prophetic vision to see it. Invention and genius, well applied, will confer their magic, and we can in our horoscope, discern clearly a rehabilitation that will give to this community a new fame. There will be no trolleys nor tracks to impede traffic or mar the landscape; no unsightly poles to create objurgations. A great city will fill the valley and the foothills, from Altadena to Los Angeles, and there will be one ambition besetting its inhabitants -- that it will be the best of all cities! Noisy trolley cars and nerve-wrecking gasoline autos will be replaced with a wonderful new motive power vehicle -- an invention by a genius educated at Throop. A new library, a new Parthenon, will rear its classic walls above a grassy Acropolis. Within its doors endless stacks of books will lure the reader from far and wide, and in it the student will have his cozy corner to browse at his content. A city hall of splendid architecture will adorn the proper spot and cause the citizen to glow with pride at its mention. In one of the parks will be a heroic bronze representing, in allegory, the Pioneer and the things he wrought. A casino, the forum where civic affairs are discussed by the citizens, and where the city band of forty-eight pieces will play each day, will be an accomplished fact -- at last! Children's playgrounds everywhere; public baths in various convenient sections in the city will add to the good cheer of the people, and there will be citizens filled with wisdom -- the wise men of the town -- who will be ready at all times to devote their spare time to the betterment of the community -- men whose highest aim is patriotism and civic pride. Colorado Street will become the real Via Crucis and Appian Way of a better age, and there bazaars of trade and the rounds of fashion will call the men and women in daily parade -- bent upon errands of business and display of styles. There will be a municipal theater where talent of the highest will tempt both wise men and busy women to relaxation and enjoyment and fortify them for sterner duties. The coming New Zealander (or New Englander) who will pause, leaning upon the parapet of the Colorado Street bridge, will gaze with eager appreciation upon a city throbbing with joyous existence -- the epitome of civic problems wrought to happy conclusion, and a citizenry filled with purposeful ideals. And thus the dreams of the civic idealist will have been accomplished! So mote it be! 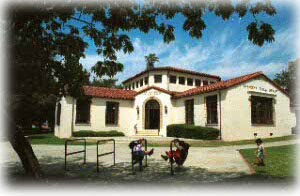 Many thanks to Pasadena Public Library for use of the Centennial Room photo. Since I've stumped you the past few weeks, here's an easier one. * 6 p.m. -- What's in store for the Hahamongna Watershed Park Annex? During the Hahamongna Watershed Park Advisory Committee meeting at La Casita del Arroyo, 177 S. Arroyo Blvd., there will be an update on the Sunset Overlook project plus an update and consideration of recommendations on adoption of the park master plan amendment for the annex. (626) 744-4321. * 6:30 p.m. – As part of our General Plan update, help map out the most important qualities and characteristics of Pasadena and define the community’s most pressing issues during a workshop at Boys & Girls Clubs of Pasadena, 3230 E. Del Mar Blvd. (626) 744-4009. * 1 p.m. – This week’s film in the Donald R. Wright Auditorium at Pasadena Central Library, 285 E. Walnut St., is “A Beautiful Mind” about Nobel Prize-winner John Forbes Nash’s experiences with schizophrenia. (626) 744-4066. * 6:30 p.m. – “Streets, Traffic and Transit” is the topic of a panel discussion followed by plenty of audience Q&A at PCC’s Community Education Center, 3035 E. Foothill Blvd. as part of our General Plan update. Speakers are Ellen Greenberg, an expert in smart mobility, sustainable streets and transit-oriented development; and Philip Erickson, president of Community Design + Architecture and a planner, urban designer and architect with special expertise in city streets. (626) 744-4009. 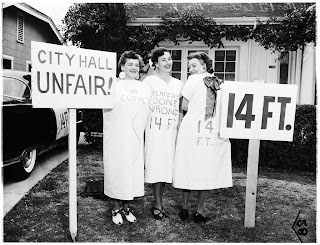 In the 1958 photo above, three women (l-r Pat Colburn, Vi Berry and Ernestine Steele) wear sheets fashioned into dresses to draw attention to the proposed widening of Washington Street. The proposal was for Washington to be widened by taking 14 feet off only one side -- their side -- of the street. 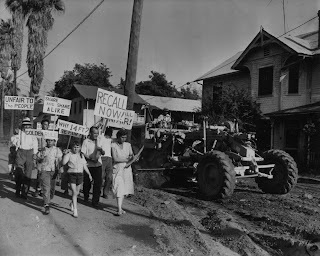 So they packed themselves and their signs into the car at left and headed to Pasadena City Hall to protest the project. They lost the battle and the project moved forward. They demanded a recall of four members of the Board of City Directors (now called the City Council). That one didn't have enough support, either. Washington Street was widened and "Street" was changed to "Boulevard." Many thanks to Los Angeles Public Library for use of the photos. What are these women doing? And why? * 4 p.m. – Children 5 to 12 will listen to stories and make their very own piñatas in celebration of Hispanic Heritage Month at Hastings Branch Library, 3325 E. Orange Grove Blvd. (626) 744-7262. * 6:30 p.m. – Help map out Pasadena’s most important qualities and characteristics and define the community’s most pressing issues during a General Plan community workshop at La Casita del Arroyo, 177 S. Arroyo Blvd. (626) 744-4009. * 1 p.m. – This week’s film in the Donald R. Wright Auditorium at Pasadena Central Library, 285 E. Walnut St., is “Freedom Writers” starring Hilary Swank, Patrick Dempsey and Scott Glenn in the true story of a young teacher who inspires her at-risk students to keep journals and applies lessons from history to help break the cycle of violence and despair that threatens their young lives. (626) 744-4066. * 6:30 p.m. – If you can’t make the Sept. 22 General Plan community workshop, there are other opportunities including this one at First Church of the Nazarene of Pasadena, 3700 E. Sierra Madre Blvd. www.cityofpasadena.net/generalplan. (626) 744-4009. * 7:30 a.m. to 5:30 p.m. – City of Pasadena administrative offices will be closed. * 1 p.m. – Step into the world of social networking with “Facebook for Grownups” at La Pintoresca Branch Library to learn what Facebook is, how it works and how to create your own page. Reservations are required: (626) 744-7268. * 10 a.m. to noon – Learn how to recycle your yard waste and kitchen scraps into environmental responsible compost that’s great for the garden during a workshop at Linda Vista Branch Library, 1281 Bryant St. Compost bins will be on sale for $50. (626) 744-7278. * 1 p.m. -- Heavy lifters will compete for trophies and prizes during the fifth annual bench press competition at Villa-Parke Community Center, 363 E. Villa St. These folks aren't just playing around -- they're accustomed to lifting 200 pounds or more! (626) 744-6523. In the photo above (left to right) Pasadena firefighter Jim Branch, vice detective Clinton Wright and firefighter Leif Brandin examine a refrigeration container filled with sulphur dioxide gas that was hurled by a bookmaker who managed to escape during a raid. A bookmaking suspect who was "definitely" identified as an ex-police vice squad officer escaped from a raiding party of police and sheriff's deputies here yesterday under cover of a bomb barrage of deadly sulphur dioxide gas. Tabbed as the suspect was Robert T. Wiseman Jr., 26, who quit the force suddenly on Aug. 31, 1950. The bizarre raid took place at the expensive two-story home of Wiseman's father. . . in the shadow of Caltech. Amid dense clouds of gas from the bombs, Wiseman Jr. fought furiously with the officers for several minutes inside the house but finally broke away from them and fled. The elder Wiseman was away when the raid occurred but returned before officers left. He said he'd left the house shortly before noon after setting off the gas cylinders to kill termites "and varmints." During the [struggle] the officers wrested a black notebook from Wiseman [Jr.]. The book contains numerous "owe" sheets. Handwriting experts were brought in to try and crack the "Case of the Gassed Bookie Raiders" by determining whether Wiseman, according to the Pasadena Independent, "wrote the notes in a 'little black book' which was wrested from him before he vanished in a cloud of deadly sulphur dioxide gas fumes. If he did, he'll probably have to face a bookie rap. If and when police catch up with him." There are no follow-up articles stating that Wiseman was caught. The first person to guess correctly (or even closely) will win a fabulous prize! 10 a.m. to 1 p.m. – The family-friendly water conservation fair at Allendale Park will include demonstrations, information about how to save water and plan drought-tolerant gardens, lots of freeebies, food prepared by our very own firefighters, children’s activities and plenty of fun. 10 a.m. to 12:30 p.m. – Are you trying to get a grant but don’t know how to begin? Staff from Flintridge Foundation will be on hand at La Pintoresca Branch Library, 1355 N. Raymond Ave., to show you how to generate targeted lists of funding prospects in seconds. Reserve your spot by calling (626) 449-0839. *4 p.m. – Children 5 to 12 will be transported to the Hawaiian Islands by the music of Kimo West, one of the world’s top “slack key” guitarists, at Hastings Branch Library, 3325 E. Orange Grove Blvd. (626) 744-7262. * 6:30 p.m. – What do you get when you seat a full-time parent next to a retired machinist, a graphic arts student and a nurse who works the night shift? Enlightening conversations! Lend your voice during a series of community workshops about the General Plan during which you'll help map out the most important qualities and characteristics of Pasadena and define the community’s most pressing issues. Tuesday’s workshop will be at Jackie Robinson Center, 1020 N. Fair Oaks Ave. (626) 744-4009. * Also at 6:30 p.m. – A proposed city ordinance would require the monitoring of water used in the irrigation of grass, shrubs, trees and other plants in landscaped areas on very large public and private properties (equivalent of about 43,000 square feet of landscaped area on public and commercial properties and 5,000 square feet of landscaped area on residential properties). Learn more about it during a public meeting at the Salvation Army Tabernacle Fellowship Hall, 960 E. Walnut St. Enter the parking lot from Mentor Avenue. (626) 744-6880. * 1 p.m. – This week’s film in the Donald R. Wright Auditorium at Pasadena Central Library, 285 E. Walnut St., is “Pay It Forward” starring Kevin Spacey, Haley Joel Osment and Helen Hunt in the true story of a boy who responds to a school assignment with a plan to help three people who will help three more, and so on, in an ever-widening circle. (626) 744-4066. * 6:30 to 8 p.m. -- What do you think about density in Pasadena? Architectural design? Traffic? Hear what the future has in store during the first in a series of community talks at PCC’s Community Education Center, 3035 E. Foothill Blvd. Panelists on Wednesday will include Dowell Myers, USC professor of policy, planning and development, and director of the Population Dynamics Research Group; Lisa Padilla, principal of CityWorks Design in Pasadena; and Bill Huang, director of the Pasadena Housing Department. After a conversation among the panelists, there will be plenty of time for Q&A. The speaker series is among many activities organized in association with Pasadena's General Plan update. (626) 744-4009. If you’re interested in providing input on a marketing plan for Northwest Pasadena, today’s the last day to sign up! (626) 744-6750. Take one or more of the self-guided MoveAbout Tours on your own or with family, friends or neighbors. The final day for taking the tours has been extended by popular demand -- the guidebooks are flying off our public counters so we've done a second printing. (You're seeing it here first; I'm not announcing the extension until Monday.) Download the entire guidebook or print it out one tour at a time. Be sure to get your "passport" pages stamped at the stops that are listed so you'll eligible for prizes at our big General Plan open house in November. Be sure to turn in your guidebooks, complete with your written impressions, no later than Oct. 12. This is one of many activities planned in association with Pasadena's General Plan update. (626) 744-4009. Well, I have some of the answer but not the full answer! 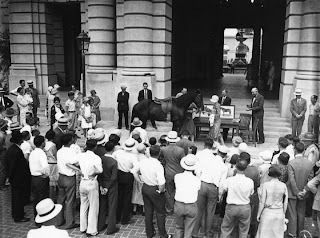 A beautiful brown horse that mounted the city hall steps to receive an honor ribbon for his now dead rescuer aroused great interest. Billy Watkins is the steed's name, and his loving mistress, 10-year-old Marcia Luckie, was represented at the ceremony by Mrs. W.A. Boucher, widow of the Pasadena veterinarian and former owner of Skeezicks, Billy Watkins' rescuer. The question is: Does the article correlate directly to the photo? And what were the circumstances of the rescue? Or is the horse in the photo named Wolf? "Clue" Chivvis, former cowboy, who resides in La Canada, narrowly escaped death today when a pack mule, which had been tied to the pummel of the saddle of Chivvis's horse, stumbled on a mountain trail and dragged horse and rider over a fifty-foot precipice. "The mule was walking behind," related Chivvas, "and he either stumbled or else the outer edge of the trail caved in. The pack animal shot out into space and the jerk on my saddle caused the horse to rear backward into the canyon. I was thrown into space also but my fall was broken when I landed on the horse's belly." The horse and mule escaped serious injury due to he fact that their backs were protected by the saddle and pack. "Wolf," the horse, was cited for bravery in an animal-hero contest last summer. The citation was based on Wolf's heroism in bearing victims of the St. Francis Dam disaster to safety. Today's accident took place on the trail from Pine Flats to Mt. Wilson. So the mystery continues. Our research team at Pasadena Public Library is working on getting more detailed background. I'll be sure to post it here. In the meantime, I promise I'll never post a historic photo again without knowing the full story behind it in advance! 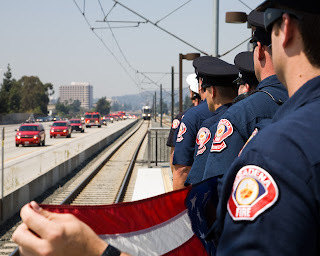 Pasadena Fire Department personnel stood on the platform of a Metro Gold Line station as a funeral procession passed by today on the 210 Freeway. 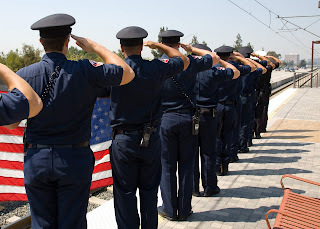 The procession was for Los Angeles County Fire Captain Tedmund Hall who died along with Fire Specialist Arnaldo Quinones on Sunday battling the Station Fire. 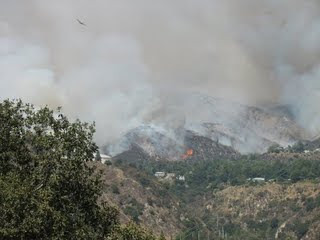 Pasadena is out of harm’s way at this time as the Station Fire continues to burn in the Angeles National Forest. As of today the fire is 42 percent contained. The Pasadena Public Health Department reminds everyone that although air quality has improved today, it still remains unhealthy for people with health issues. Schools that are in session, after-school programs and children’s sports organizations should consider limiting outdoor activities today. Even when there is no odor of smoke, individuals with respiratory or heart disease, pregnant women, elderly persons and children should continue to take precautions when they are outside. Results from local air monitoring indicate that air quality is most unhealthy in the morning hours but tends to improve throughout the day. Hot weather continues but is expected to decrease slightly as the Labor Day weekend approaches. Tips for staying cool include wearing light, loose-fitting clothing, drinking plenty of water and fluids, avoiding alcoholic beverages and staying in air conditioned areas during peak hours. For emergency preparedness information, visit www.cityofpasadena.net/disaster. For more information about preventing the health impacts of smoke, visit http://www.aqmd.gov/ej/CAC/wildfire_safety_tips.htm or call the Pasadena Public Health Department information line at (626) 744-6012. It was a packed house last night with standing room only at Pasadena Church of the Nazarene as the Station Fire Incident Management Team provided updates on the status of the fire and answered questions from constituents. Most of the people in attendance were from Pasadena, Sierra Madre, Altadena and Arcadia, and praised the team repeatedly while asking good questions. This is the kind of community meeting I love -- where there's no complacency and people are all fired up (no pun intended)! First I want to echo the well deserved applause. Chief Mike Dietrich of the U.S. Forest Service, who is the incident commander on the Station Fire, and the rest of the incident command team who spoke to the 300+ people last night -- including Pasadena Battalion Chief Martin Johnson and representatives from Angeles National Forest and the Los Angeles County Sheriff's Department -- were very informative given the fact that they have been working nearly around the clock since the fire began. Managing the response to such a devastating fire isn't an exact science. As of last night, the fire had consumed more than 147,000 acres -- the largest recorded fire in the Angeles National Forest since it was established as a timberland area. As of last night, the fire was 30 percent contained, and as of today it is 47 percent contained. "There's no such thing as letting up on this fire." "We're trying to keep the fire as high and away from communities as possible." "This is now a homicide investigation." "Life is not going to be the same as we know it [in the forest area]." "The forest will have to stay closed for a long time." "Firefighters are dealing with treacherous fuel conditions." "There is unparalleled fire danger." "There are 4,800 firefighters currently from California and the western United States." After many questions from the audience, the U.S. Forest Service officials promised better communications out of the incident command center. In the meantime, keep checking http://inciweb.org/incident/1856 and www.altadenablog.com (thank you, Tim Rutt!) for updates. A community meeting will be conducted by the Station Fire Incident Management Team (IMT) Thursday, Sept. 3, at 7 p.m., to update residents of Pasadena, Sierra Madre and Arcadia about the fire that has been burning since last Thursday. City of Pasadena officials will be present as well. The meeting will be at Pasadena Church of the Nazarene’s Lee Chapel, 3700 E. Sierra Madre Blvd. It's a public meeting, so if you live in another community you're welcome to attend! The IMT is conducting a series of meetings in San Gabriel Valley foothill communities over the next few days. No winner this week. Admittedly, this was a hard one. Continuing the presidential theme, this decorated locomotive is nearly ready to carry President Benjamin Harrison's train to Pasadena on April 23, 1891. President Harrison was on a 30-day, 9,332-mile round trip from Washington, D.C., to the Pacific coast and back. . . .The presidential train was booked to arrive here at 7 o’clock but it was a quarter to eight before its whistle was heard. . .
. . .When the trained pulled in at the Santa Fe depot, closely followed by Governor Markham’s special, the park and streets about the Hotel Green and the station were packed with people who had patiently waited there for an hour and more. Great cheering greeted the party as they disembarked and walked into the hotel between Company B drawn up one side to receive them and the veterans of the Grand Army on the other, while Steil’s battery of one gun boomed forth in thunderous salutation. . .
. . .Then the south doors were opened, and for an hour the immense throng outside filed through and past the presidential party. The officers and men of Company B, who had been doing difficult guard duty outside, lent their efficient services in keeping the lines in order, and in hastening the passage of the multitude through the corridor. It was a trying ordeal for the president, but he bravely kept his post and shook hands with each man, woman and child as they were presented by Governor Markham, as did also the postmaster-general and the secretary of agriculture. It is estimated that at least 2000 people were thus taken by the hand. It was half-past ten before the reception was over. . . 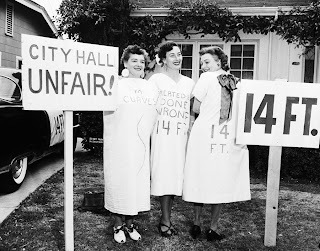 The article goes into great detail about speechifying, what the ladies were wearing, who sat on the various welcoming committees and other fascinating bits that are too lengthy to include on my humble little blog. …The president’s carriage, which had been beautifully trimmed with acacia by Mrs. Masters and Mrs. B.M. Wotkyns, was drawn by four beautiful horses, two blacks and two grays. 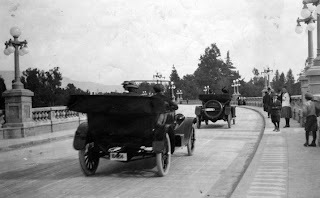 . .
Here’s a photo of President Harrison’s carriage during a stop at the Los Angeles House hotel in Pasadena. The tour through Pasadena must have taken all day: The designated route was Colorado to Marengo, California, El Molino, Walnut, Raymond, back to Colorado, Fair Oaks, Orange Grove, back to California, to Pasadena Avenue, Bellefontaine, back to Orange Grove, Columbia, the Raymond Hotel, back to Columbia, Colorado, "through Mrs. Carr's grounds," back to Colorado, and then back to Raymond and the Hotel Green. The route was announced well in advance so as many people as possible could line the streets to welcome the president and his party. ...The point of greatest interest was on South Marengo avenue, where an immense crowd had congregated, including about 2000 school children. Handkerchiefs were waved and some cheering indulged in, but the lack of music made the demonstrations of this kind not as noisy as they should have been. Marengo avenue presented a beautiful appearance. Just below the crossing of Kansas street the party passed beneath an imposing arch built of calla lilies and surmounted by pampas plumes. The north front of the apex bore a large portrait of the president, and beneath were the words, in letters made of oranges, “Welcome to our Guests.” Below hung the monogram “B.H.” in pink and white roses. The white lilies had a background of evergreen at some points. . . There was also a lot of lobbying that took place during the president's trip to Pasadena, and it paid off: The following year, by official order, Harrison established the San Gabriel Timberland Reserve, later to be called the Angeles National Forest (which is currently burning). It was the first such reserve in California and the second in the U.S.
. . .Senator Heacock and Mayor P.J. Barber, of Santa Barbara, were here last night as a committee from that city to see that the president didn’t stay too long before leaving with them for their lovely town. . . Many thanks to Pasadena Public Library (Martha Camacho rocks! 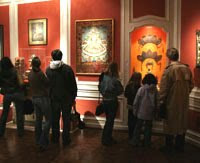 ), Los Angeles Public Library, Pasadena Museum of History and University of Southern California. The two Pasadena engine companies have returned from the Station Fire incident in the Angeles National Forest. One Pasadena battalion chief remains assigned to the Station Fire Incident Command Center and one captain is assigned to the incident command team for the Morris Fire. The Station Fire is expected to continue moving eastward today with moderate intensity. There is no anticipation that Pasadena homes and other structures are in danger today. A community meeting will be conducted by the Station Fire Incident Command Team tomorrow (Thursday) at 7 p.m. at Pasadena Church of the Nazarene, 3700 E. Sierra Madre Blvd. City of Pasadena officials will be at the meeting as well. The Pasadena Public Health Department reminds everyone to take precautions when they are outside and avoid unnecessary outdoor activities, especially people with respiratory or heart disease, pregnant women, elderly persons and children. Schools that are in session, after-school programs and children’s sports organizations are advised to cancel outdoor activities until conditions improve. 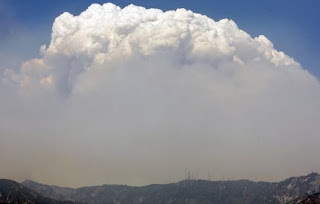 Short-term effects of ash and smoke from the fires may include irritation of eyes, airways and sinuses, coughing and/or scratchy throat, headaches and runny nose; long-term effects may include decreased lung function. Children are more sensitive to air pollution because their respiratory systems are still developing and they breathe more air per pound of body weight than adults. High temperatures worsen the affect of poor air quality and can adversely affect the public’s health. Never leave children, elderly persons or pets unattended in closed vehicles, even with windows slightly opened, because the inside temperature can rise to life-threatening levels. Avoid leaving pets outdoors, especially at night. Pets that appear to be in respiratory distress should be taken to an animal hospital immediately. Respiratory distress symptoms for dogs include panting and/or inability to catch their breath; symptoms for cats can be the same but are less noticeable. Visit www.cityofpasadena.net/disaster for emergency preparedness information. For more information about preventing the health impacts of smoke visit http://www.aqmd.gov/ej/CAC/wildfire_safety_tips.htm or call the Pasadena Public Health Department information line at (626) 744-6012. More detailed information about the fires can be found at http://inciweb.org/incident/1856 and at www.altadenablog.com. The Pasadena Public Health Department reminds everyone that air quality remains unhealthy today due to the Station Fire. Everyone should take precautions when they are outside and avoid unnecessary outdoor activities, especially people with respiratory or heart disease, pregnant women, elderly persons and children. Schools that are in session, after-school programs and children’s sports organizations are advised to cancel outdoor activities until conditions improve. The Pasadena Fire Department has two fire engines and 10 personnel on the fire lines to assist in combating the Station Fire. They are working side-by-side with firefighters from many other jurisdictions who have been assigned to the blaze. Flags at all Pasadena fire stations have been at half-staff in memory of Arnaldo Quinones and Tedmund Hall of the Los Angeles County Fire Department who died in the line of duty on Sunday. Pasadena Fire Department personnel also are wearing black bands across their badges in honor of their fallen brothers. People from evacuated neighborhoods in other communities who are staying with friends or relatives in Pasadena may need to arrange for short-term, temporary overnight parking permits. Special permits will be available beginning Sept. 2 at no cost at the city's Parking Office, 221 E. Walnut St., Suite 199. The permits will expire on Sept. 7. Visit www.cityofpasadena.net/disaster for emergency preparedness information; visit www.aqmd.gov/ej/CAC/wildfire_safety_tips.htm for information about preventing the health impacts of smoke or call the Pasadena Public Health Department information line at (626) 744-6012. Excellent ongoing coverage of the fire situation can be found at www.altadenablog.com. Many of our local bloggers have been posting about the fires, including fantastic photos. Take a gander at the list on the right and click away! This locomotive is decorated to the nines. Why? The first person to guess correctly will win a fabulous prize?